The Grand Priory of England, Wales, Isle of Man and Channel Islands of the Hospitaller Order of Saint Lazarus of Jerusalem was formed, consecrated and established on the 1st January 1995 as a British ‘confraternity of hospitallers’ who apply themselves to the relief of those in need of hospice care. The confraternity models itself upon the traditions and ideals of the ancient, chivalric and hospitaller Order of Saint Lazarus, and in recognition of the importance of that historical Order of Chivalry(1) the confraternity presents itself today as a practical and working hospitaller organisation, more appropriate to the humanitarian needs of the 21st century. The constitution and structure of the confraternity has been so successful that it has been emulated in various parts of the world. 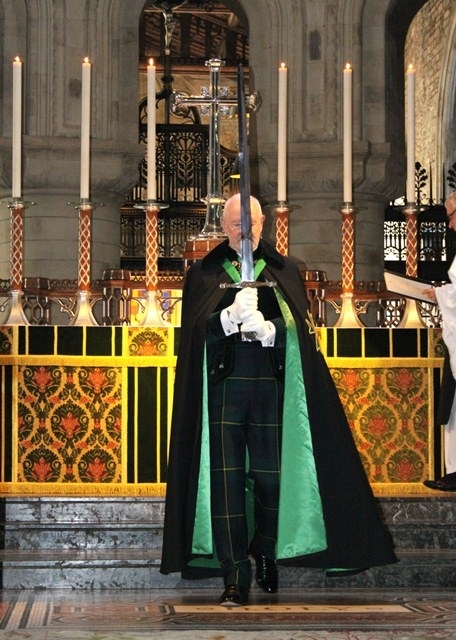 All members of the confraternity, both in the UK and overseas, work under a single umbrella body known as The United Grand Priories of the Order of Saint Lazarus of Jerusalem, which was formed on the 13th May 1999. The Grand Council of The United Grand Priories is a Christian organisation that sees its function as an opportunity to foster ever stronger ecumenical bonds between the various branches of Christianity. To this end it hopes to encourage members and clergy from all parts of the Christian community to belong to the Order, and work together in harmony and understanding under the banner of Saint Lazarus. Whilst each Grand Priory has its own independent national hospitaller programme it is assumed that from time to time all branches of the confraternity may join together for a common humanitarian purpose. As it is the intention of the Grand Priory of England, Wales, Isle of Man and Channel Islands to focus its activities on the hospice movement it formed the Saint Lazarus Hospice Association, a charity registered with the Charity Commissioners (No.1062740). Today the men and women of the Order are carrying out their hospitaller work according to the principles established by the founders of the Order of Saint Lazarus in the 12th century, which are as relevant now as they were in those ancient times. All potential members of The United Grand Priories must have their application sponsored by a Knight/Dame of the Order and they should realise that they are expected to support the charitable aims of their individual Grand Priory and attend its functions. Postulants for entry into The United Grand Priories of the Order of Saint Lazarus of Jerusalem will be received in one of the following grades, Member, Officer, Commander or, on very rare occasions, as a Knight or Dame. A decision to join should only be taken after deep contemplation of the duties involved, the verification of which should be obtained from the sponsoring member. (1) To be recognised as a legitimate Order of Chivalry an organisation must be accepted as such by the State in which such recognition is sought. This confraternity, however, seeks no such recognition, nor has it any pretentions of being an ‘order of chivalry’ directly descended from the original Order of Saint Lazarus, which came to prominence during the Crusades, and ceased to exist in 1824. The Hospitaller Order of Saint Lazarus of Jerusalem was a military, religious and hospitaller Order of Chivalry. It bore no resemblance to modern-day historical or charitable organisations. It was military in that it played a military role from 1120 to about the beginning of the 16th century. Until 1291 its military activities were centred in the Holy Land helping to hold it for Christianity, while after its loss they involved the protection of the pilgrim routes, particularly of that to Santiago de Compostela. The military role was revived in the early 17th century when the Order maintained a squadron of ten frigates based at St Malo, manned by the knights, novices and chaplains. With the ending of the Order’s naval activities in 1668, the military role was continued through its naval academy, and the ownership of a military school in Paris, which it held until the French Revolution in 1791. With regard to the religious aspect, the Order was originally an order of monks taking the triple vows of poverty, chastity and obedience. The monastic character was in no way lessened when it commenced its military role. The Order was hospitaller in that its origins allegedly stem from a leper hospice founded in the 4th century. Subsequently it operated a hospice for lepers in the 12th century outside the walls of Jerusalem. Despite its eventual military role, it remained primarily a ‘hospitaller Order’, operating a worldwide network of hospitals and Lazar Houses. The Order was chivalric in that it became a monastic Order of Knighthood in the early 12th century. Its ranks held those who were already knights or those of noble birth who received knighthood after entry into the Order. The Order always had the power of conferring knighthood on any person deemed suitable. This ancient prerogative was enshrined in the Act of 1624 which created the category of Knights of Grace, where nobility was not required. This power, to confer knighthood, remained unimpaired from the 12th century and needed no recognition for its validity, preceding, as it did, all secular knighthoods still surviving to this day. Apart from this knightly aspect of chivalry, it also implied that privilege went hand in hand with responsibility, to care for the sick and protect the weak. It was service without being servile, the use of one’s effort and strength for the purpose of Christian and human charity. The Order was not a reward, but a commitment of service past, present and future, to carry out its aims, and to work for humanity in its name. Through the dedication of its knights and members, its nobility of purpose in caring for the sick, and its splendid history, the Order’s traditions have survived intact throughout the centuries, and should continue so for centuries to come, as long as Christianity, and a need to help our fellow man, exists. It is uncertain at what date the Order of Saint Lazarus was first established in England. Certainly the Order would have been known to crusading knights and it is likely that the first brethren of Saint Lazarus were brought to this country by returning crusaders. Modern French authorities claim 1135 as the year in which Baron Roger de Mowbray presented the knights with land, and a mill, at Burton, near Melton Mowbray in Leicestershire. It was in the fertile countryside of this county that they built their great hospital (hospice), which became the chief house of the Order in England and from which, in succeeding years, numerous other hospitals and commanderies were erected throughout the country. The foundation at Burton, since called Burton Lazars, was administered by a Master and eight knights and was placed under the protection of the Blessed Virgin and of Saint Lazarus. ‘We have recognised that the Holy House and Hospital of Saint Lazarus of Jerusalem is splendid and praiseworthy in the works of mercy, whereof we have sure faith and witness by the experience of our own eyes’. This was testimony indeed from England’s most illustrious crusader! Subsequent Royal benefactors of the Order were King John in 1200 and Henry III in 1216. On 22nd October 1284 Edward I presented letters patent commanding his subjects to procure for the Master and Brethren of the Order whatever assistance their envoys would seek for the work of fighting the enemies of Christ and His Church. On 16th March 1343, in memory of his father, Edward III released the Order in England from payment of certain rents and taxes, recalling the hospitality of the Order towards lepers, and its military action against the enemies of the Cross. The administration, by the Order, of the hospital of St Giles, London, was confirmed by Henry VI in 1450. In 1439 the Master, Geoffrey Shrigley, received licence from Henry VI to apply for bulls from the Pope to enable future Masters of the Order in England to be elected without reference to the Grand Master of the Order at Boigny in France. In 1450 the Pope took the Order in England under his special protection, exempting it from all episcopal jurisdiction and decreeing that future Masters of the Order in England should be recognised as such without any further confirmation being required. This made the English branch of the Order independent of any overseas jurisdiction. By 1540 the Order was responsible for 96 Hospices within the English jurisdiction. In 1544 Henry VIII suppressed the Order in England, as he had previously done with so many other religious Orders and Foundations. In France, however, as in other parts of Europe, the hospitaller work of the Order of Saint Lazarus continued to flourish. In 1489 a Papal Bull was issued amalgamating the Order of Saint Lazarus (outside Italy) with the Order of St John. This decree was disobeyed by the officers of the Commandery of Boigny, France (Order of Saint Lazarus) and the Pope, as superior of all religious-military Orders, dealt with this thorny problem by authorising the foundation, by King Henry IV of France, of a new Order, Our Lady of Mount Carmel, and amalgamated with this the rump of the Order of Saint Lazarus of Jerusalem. It was by Papal Bull that the King gave statutes to the Order and why the Order was subject to canon law (the Italian possessions of the Order of Saint Lazarus had similarly amalgamated with the newly founded Order of Saint Maurice in 1572). Since the Order had been primarily active in France since the 14th century it follows that it was subject to all the political upheavals in that country, none more important to the Order than the decree by the Assembly for the Third Estate, on the 30th July 1791, that ALL Orders of Chivalry were abolished. This decree placed the Order, including the exiled Grand Master, outside the law. There are those who would question the authority of the Third Estate to make such a pronouncement. The King could not ‘abolish’ the Order in 1814 (anymore than could the National Assembly earlier), although the government of Louis-Philippe suppressed it in 1831, but under canon law it could only become extinct through lack of canonical admissions. This is eventually what happened. The Grand Chancery of the Legion of Honour issued a statement in 1824 to the effect that “...of the united Orders of Our Lady of Mount Carmel and Saint Lazarus of Jerusalem, the latter has not been awarded since 1788 and is allowed to extinguish itself”. 100% of ALL monies raised for the Saint Lazarus Hospice Association are used for charitable purposes. There are NO deductions made for administrative or other costs.